A limited edition 3 print suite by artist G. Harvey. Avenues of Light copyright© 1997 by G. Harvey is prohibited from being copied. 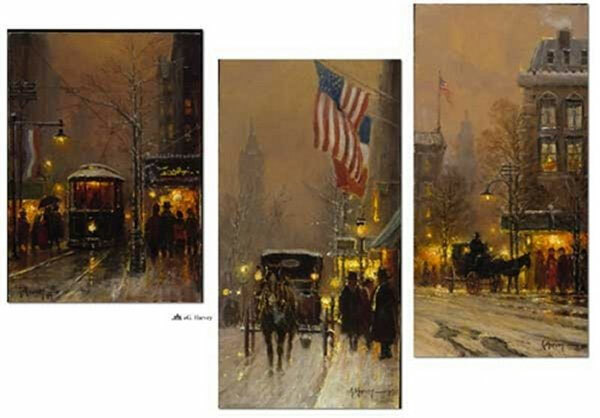 G. Harvey art, Evening Trolley, Dinner Carriage, Memories, cityscape, trolley car, carriage, winter, artwork, art work, canvases, images, paintings, pictures, and prints of Avenues of Light by artist G. Harvey for sale. Avenues of Light painting by artist G. Harvey can be purchased in art print or canvas form at special sale prices at Christ-Centered Art.